Diarrhea, the second leading cause of child morbidity and mortality, can have detrimental effects in the physical and cognitive development of children in developing countries. Health interventions (e.g., increased access to health services and safe water) designed to address this problem are difficult to implement in resource-limited settings. In this paper, we present a tool for understanding the complex relationship between water and public health in rural areas of a developing country. A spatial and temporal agent-based model (ABM) was developed to simulate the current water, sanitation, and health status in two villages in Limpopo Province, South Africa. The model was calibrated using empirical data and published sources. It was used to simulate the effects of poor water quality on the frequency of diarrheal episodes in children, and consequently on child development. Preliminary simulation results show that at the current total coliform levels in the water sources of the studied villages, children are expected to experience stunting by as much as -1.0 standard deviations from the World Health Organization height norms. With minor modifications, the calibrated ABM can be used to design and evaluate intervention strategies for improving child health in these villages. The model can also be applied to other regions worldwide that face the same environmental challenges and conditions as the studied villages. The link between improved health and access to clean water and basic sanitation is well-established in developing countries (Gundry et al. 2009; Clasen, et al. 2007; Pruss et al. 2003; Newman et al. 2002; Esrey et al. 1985). Strategies designed to improve public health in these regions often include provisions for installing water and sanitation facilities in communities (Esrey et al. 1985). However, despite steadfast efforts, inadequate safe water and sanitation services remain as perennial problems in both urban and rural communities (MDG Report 2010; ADB 2002). Many governments attempt to address the complex local situations surrounding delivery of these services, particularly in closing the large gap in services in rural and urban areas. Efforts are constrained by the availability of key resources such as budget, technology, ability to tap natural resources, and educational training (Gerlach and Franceys 2010; Kulabako et al. 2010; Nelson and Murray 2008). These resources have been adversely affected by the recent global economic downturn, possibly compromising existing programs on water and sanitation. Global goals to improve water, sanitation, and health are embodied in the United Nations' Millennium Development Goals (MDGs), in particular, in Goal 4 (reduction in child mortality) and Goal 7 (environmental sustainability). Specific benchmarks for these goals are to reduce child mortality (by 67%, based on 1990 level) and reduce the size of the population without access to clean water and adequate sanitation (by 50% based on the 1990 level) by 2015. Most recent estimates of progress towards reaching these MDGs indicate a likelihood of achieving global water targets but not the sanitation and child mortality reduction targets (Gakidou et.al. 2010; Hogan et. al. 2010; MDG Report 2010; Child Mortality Report 2010). In low and mid-low income regions, the gap in developmental progress between rural and urban communities remains wide (MDG Report 2010). National averages in the low-income regions of South Asia and Sub-Saharan Africa are even lower than global averages. Child mortality rates are also alarmingly high, with about 50% of global numbers attributed to only a few countries belonging to these two regions (Child Mortality Report 2010). At the core of health problems in child mortality and morbidity are water-related diseases such as diarrhea and malaria. These two diseases claim a combined under-five mortality of over 5000 per day (Black et al. 2010). Diarrhea alone accounts for 15% of global under-five child mortality (1.34 million deaths in 2008) (IHME 2010; Black et al. 2010). Repeated episodes of early childhood diarrhea (ECD) have also been associated with stunting and impaired cognitive development (Gundry et al. 2009; Checkley et al. 2008; Tarleton et al. 2006; Dillingham and Guerrant 2004; Guerrant et al. 1999). Corresponding health interventions have focused on expanding access to clean water and sanitation as well as implementing other strategies such as point-of-use water treatment, hygiene education, and medication (vaccine, oral rehydration therapies) (Barzilay et al. 2011; Guerrant et al. 2003; Clasen et al. 2007; Arnold et al. 2007; Fewtrell et al. 2005; Esrey et al. 1985). Under-five child mortality in Sub-Saharan Africa —1 in 8 children—is the highest among all regions and is 20 times higher than the average in developed countries (Child Mortality Report 2010). There is also a large disparity in water access between the urban and rural areas of the region. Of the urban population, 83% has access to improved water sources while only 47% of the rural population has access to some form of improved water source such as boreholes, wells, and piped water (MDG Report 2010). To assist in addressing these problems, international aid agencies allocate a significant portion of global aid funds to Sub-Saharan Africa (Lu et. al. 2010; World Health Statistics 2010; Institute for Health Metrics Evaluation 2010). In 2006, the region received 60% (US$ 3.4B) of the total country-specific development assistance for health funds (Lu et. al. 2010). It also accounted for 37% of global official development assistance in 2008 (Global Monitoring Report 2010). Concurrent health and development (e.g., water and sanitation) programs collectively result in improved public health status, but these programs are difficult to implement in resource-limited settings. Factors such as socio-political conflicts, economic constraints, and human behavior can contribute to the high variability in the efficacy rates of intervention strategies (Armitage et al. 2009; Baker et al. 2009; Eisenberg et al. 2007; Clasen et al. 2007; Arnold et al. 2007; Fewtrell et al. 2005; ADB 2002). Understanding the complexity of these human-environment interactions could be the key to identifying the most cost-effective health interventions in communities. Coupled human and environmental models, such as agent-based models, have been suggested as potential tools for studying these dynamic human and environmental interactions (Demarest 2011; Galan et al. 2009). In this paper, we present a tool for studying the complex relationship between water and public health in rural areas of a developing country. A spatial and temporal agent-based model (ABM) was developed to simulate the current water, sanitation, and health status in two villages in Limpopo Province, South Africa. The model was calibrated using combined empirical data and published sources. It was used to demonstrate the detrimental effects of poor water quality on ECD frequency and child development. Definitive studies on the relationship among water quality, sanitation, and ECD began over two decades ago when researchers found that child mortality due to diarrhea can be reduced by introducing improvements in water quality and waste disposal practices (Esrey et al. 1985). Subsequent research focused on identifying appropriate interventions such as hygiene education and delivery of health services, and quantifying the health effects of these interventions (Eisenberg et al. 2007; Fewtrell et al. 2005; Kosek et al. 2003; Guerrant et al. 2003; Esrey et al. 1991). Direct quantitative correlations between water quality and enteric diseases, and enteric diseases and impaired child development have been derived from systemic review and meta-analyses of data from studies across the globe. Gundry et al. (2009) examined dysentery and diarrheal rates in children ages 12 to 24 months and found a statistically significant increase, by a factor of 2.9, in the episodes of dysentery if water sources contained E. coli counts of at least 10 colony forming units (CFU) per 100 mL. The World Health Organization (WHO) also acknowledges that a number of E.coli strains can cause mild to acute diarrhea, and children under 5 years of age are especially at risk of infections from these microorganisms. Enterohemorrhagic strains, such as E.coli O157:H7, are substantially more infectious than any other strain (WHO DWQ Guidelines 2008). A study by Guerrant et al. (1999) of 26 children (ages 6-9 years) from a poor urban community in Brazil demonstrated the long-term impacts of ECD on the physical and mental development of children. Repeated episodes of diarrhea from birth to 2 years have been statistically correlated with impaired growth and cognitive function in later years. Niehaus et al. (2002) also reported cognitive deficiencies in 46 children, aged 6-10 years, who have had repeated diarrheal episodes in the first 2 years of life. These developmental deficiencies in physical and mental abilities are believed to be caused by a decrease in nutritional assimilation by the body due to repeated diarrheal episodes (Dillingham and Guerrant 2004). This theory is supported by quantitative findings from meta-analyses of data from long-term and multi-country cohort studies (Checkley et al. 2008; Moore et al. 2010). Checkley et al. (2008) conducted a meta-analysis of child health data from five countries collected over the span of 20 years and found that children below 2 years of age suffer nutritional deficiencies resulting from cumulative ECD episodes. These deficiencies were evaluated using Height-for-Age Z (HAZ) scores that were compared to WHO norms, and led to measured stunting among the children at ages 6, 12, and 24 months. Statistical analysis of the data also indicated that the likelihood of stunting at 24 months increased by a factor of 1.13 for every five diarrheal episodes. To investigate the impacts of prolonged diarrhea on nutritional status, Moore et al. (2010) performed a similar analysis of health data from 414 children under two years old in a ten-year cohort study. The duration of diarrheal incidence was classified into: acute (duration < 7 days), prolonged (duration 7 to 13 days), and persistent (duration > 13 days). HAZ measurements were taken three months prior to and three months after a diarrheal episode. The researchers observed a significant decrease in HAZ scores, from -.81 to -1.40 (p = .0002) in the period after the children's first prolonged diarrheal illness. Acute episodes showed declines in HAZ from -.51 to -.82, with p < .0001. The two study villages are adjacent villages separated from north to south by the Pfaleni River and bounded to the south by the Mutale River [Figure 1]. They are located in the Vhembe district in Limpopo province, South Africa, and are approximately 550 kilometers northeast of Johannesburg. The main sources of livelihood in the area are crop and livestock farming. Farms are usually situated in the backyards. During the dry season when grass is limited elsewhere in the villages, some farmers bring their livestock to graze close to various locations along the Pfaleni River. At the time of water sampling in the river in December 2010, evidence of animal defecation was observed along several points of the river banks. Water for agriculture and domestic needs are sourced mainly from the Pfaleni River, with supplement from the Mutale and Tshala Rivers and from piped water supplied by the Mutale municipality through communal tap stands. There is a slow sand filtration (SSF) system located in one of the villages that provides treated (filtered and chlorinated) water in the village. The system consists of a sand filter column and two 10,000-L chlorine tanks. The sand filter is gravity-fed with water from the Pfaleni River. It operates for approximately six hours daily when in service. Additionally, these two villages, along with five other villages, form a suburb of the Mutale municipality. This suburb is one of the eight global sites participating in an ongoing 5-year study on malnutrition and enteric diseases (Mal-ED) among children. The study is led by the University of Virginia (UVA) and is funded by the Gates Foundation through the Foundation for the National Institutes of Health. It seeks to understand how malnutrition and intestinal infections cause growth and cognitive developmental problems in children living in developing countries. Both empirical and published data were gathered to parameterize the agent-based model of the two villages. Empirical data were obtained from previous research projects implemented in the villages, including: 1) a comprehensive household census in 2009; 2) a willingness-to-pay survey for a ceramic filter scoping study; and 3) an ongoing yearlong microbiological testing of water from the water sources and the households. Aggregated preliminary data from the ongoing Mal-ED study were also collected to verify the ABM simulation results. Other required input data (e.g., ECD rates and stunting effect) that were not available from previous studies in the villages were obtained or inferred from relevant literature. The base statistics describing the ABM environment were derived from a census carried out over several months in 2009 in the two villages. The survey was jointly conducted by students from UVA and from the University of Venda in Limpopo. It polled 1,597 residents in 457 households (187 in one village and 270 in the other). The pertinent questions asked were: household and family demographics, primary and secondary water sources in the households, sanitation facilities and practices, and the presence of livestock in and around the household property. 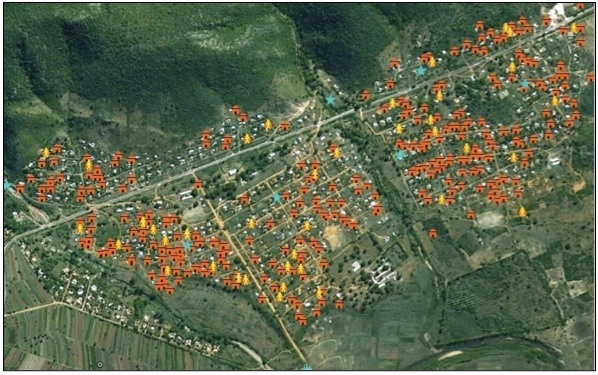 A number of reading and coding errors in global positioning system (GPS) locations reduced the number of households that could be spatially represented in the ABM to 317 (147 in one village and 170 in the other village). It also led to the failure in establishing a child's location relative to a specific water source. As a result, model input data on the demographic profile of the households were based only on aggregated data from the census. In the 2009 census, 238 children younger than eight years old were accounted for in the two villages. Of these, 89 children were aged 24 months or younger, translating to a ratio of one child younger than 24 months for every five households. Scaling to the adjusted number of households to be represented in the ABM, 63 children younger than 24 months are then represented in the 317 modeled households. The SSF system is located northeast of one of the villages. The water discharge rate in the Pfaleni River limits the operation of the sand filter to six hours per day. The filtration system is designed for gravity-induced flow of river water into a sand column. Filtered water then flows into mixing tanks dosed with chlorine tablets. After sufficient retention time, the treated water is distributed to a subset of the households through distribution pipes. The operation of the SSF system has experienced some technical setbacks since the system's installation in 2008. Often, river water bypassed the sand filter and was instead directed to the chlorine tanks prior to distribution. There are a total of 14 communal municipal tap stands in the villages. This water is fed from the Mutale municipality's central water treatment and distribution system. According to the households polled in the 2009 census and in the ceramic filter scoping study, the taps are rarely operational. In the village where the sand filter is not available, households are forced to rely on the rivers despite an expressed preference for the municipal taps. 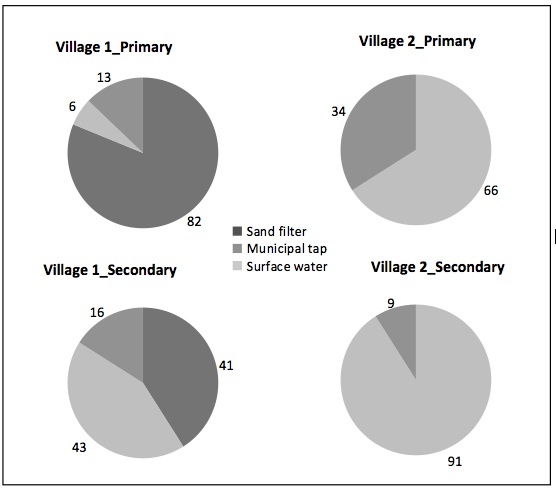 Due to the distinct water access conditions in the two villages, a majority of the households in the village with the sand filter would prefer to obtain water for domestic use from the slow sand filter system, regardless of its operational status, while households in the village without the sand filter largely rely more on the rivers [Figure 2]. To study the contamination routes along the water pathway from source to point-of-use in the households, a year-long monthly water quality monitoring for coliform bacteria ( E. coli and total coliform) was started in December 2010. Duplicate water samples were collected from a total of 32 sampling locations: 5 locations in the Pfaleni, Tshala, and Mutale Rivers; 7 locations along the inlet and distribution lines of the slow sand filtration system; 5 locations of municipal tap stands; and 15 from representative households that can be associated to a specific water source (river, municipal tap, or sand filter). The households were randomly selected from a pool of households currently participating in the Mal-ED study rather than from among all households in the two villages. While this selection criterion might introduce a geospatial bias in the statistical analysis of the water quality data from the households, it also ensures that these data can be correlated to the aggregated child growth data from the Mal-ED study. Although 5 municipal tap stands within the two villages have been included in the identified sampling locations for the year-long water quality testing, only a few of these tap stands were operational during the sampling times from December 2010 to May 2011. The conceptual model [Figure 3] of the ABM for the two villages was developed based on the observed relevant interactions and relationships in the villages. It depicts how pathogens (coliform) moving through the water pathway are ingested by a child, resulting in diarrheal episodes, and consequently, the likelihood of stunting. Figure 3. Conceptual Model of the ABM. The quality of the water in the household is determined by the water quality (represented as normally distributed) of the water source and other contributions from the storage vessels and at the point of use. 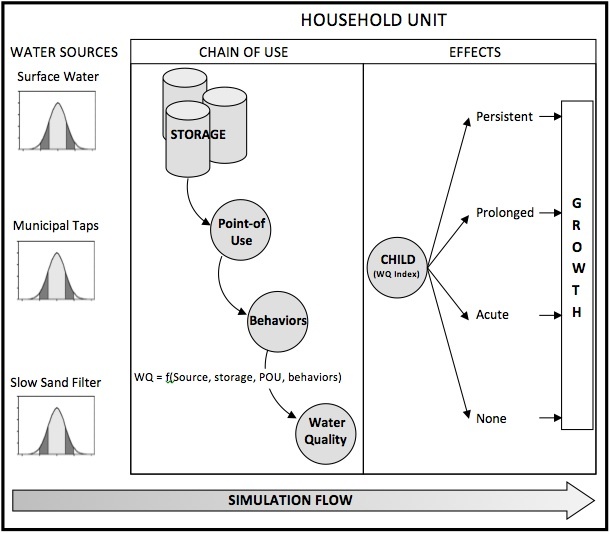 In this model, the quality of the water consumed by the child in the household is used as a predictor of the frequency of diarrheal episodes, and thus as an indicator of the likelihood of stunting. The communities, as represented in the model, have three options for water sources: municipal taps, surface water (rivers), and sand-filtered water. The reliability (fraction of time when source is accessible) and quality (coliform levels) of the water sources are represented as stochastic values based on the assumption of random Normal (Gaussian) distribution. Reliability was inferred from responses in the 2009 census and willingness-to-pay survey, while coliform levels were obtained from a statistical analysis of the results from the water sampling done monthly from December 2010 to February 2011. Depending on their proximity to and the availability of the water sources, households select a water source and store collected water in storage vessels. The vessels and the storage duration can change the coliform level in the stored water due to bacterial growth and decay. Household behaviors can reduce, through an intervention (e.g., hand washing), or increase, through poor hygiene practices, the coliform level in the water before a child consumes the water. The coliform level of the household consumed water determines the model's probability that a child will experience diarrheal illness, with higher total coliform levels resulting in an increased likelihood of a diarrheal incident. While there are other sources of coliform contamination, e.g., food intake, and the ingestion of coliform bacteria is also a function of the quantity (volume) consumed, only the concentration of coliforms as measured by WQ are used in the model. At all household coliform levels, there is a non-zero probability that a child does not experience a diarrheal incident with the consumption of contaminated water. This likelihood is also modeled stochastically in the ABM. The frequency of diarrheal incidences is classified as follows: acute for incidences lasting between 7-13 days within a 21 day period, prolonged for incidences lasting from13 to 20 days, and persistent for episodes lasting at least 21 days. In the ABM simulation, the children's heights are measured every twenty-one time steps, with one time step equivalent to one day. This interval (21 days) was selected to coincide with the minimum number of consecutive days a child has diarrhea for the diarrheal episode to be considered persistent. HAZ scores are then computed from the height measurements and compared to WHO norms. The ABM model was coded in NetLOGO version 4.1.1. A map background of the modeled environment was imported from Google Maps® and the x and y coordinates of the NetLOGO system were converted to latitude and longitude format. All 317 households were overlaid on the map layer using the GPS coordinates from the 2009 census [Figure 4]. The locations of the water sources were also spatially represented and overlaid on the map using GPS coordinates taken during the water sampling in December 2010. The locations of the initial 63 children were randomly selected. There is one agent in the modeling environment: the household. There are also three elements that act as repository of data and processes: storage vessels, point sources, and water sources. Each child is characterized by its age, gender, height, an ECD episode counter, and a history of diarrheal illness. Male and female average heights at birth are comparable (WHO Multicentre Growth Reference Study Group 2006) therefore child birth heights are generated from a Normal distribution with a mean of 49 cm and a standard deviation of 2 cm for both male and female births. The gender distribution was based on the 2009 census population. The annual birth rate was also inferred from the census data and was modeled as a uniform distribution with a range of 33-43 infants. At each time step in the simulation model, a water quality index (WQHH) is computed for each household agent. This water quality index is determined from the quality of the water source used by the household and the incremental additions specific to that household. To each household is also associated a storage element and a point source element holding the coliform values for WQSt and WQPS, respectively, as shown in Eq.1. These two elements are integral to the model because they represent points in the water chain where opportunities for additional water contamination can occur at the household level as well as other points where intervention can be introduced. This assignment of elements allows households with distinct hygiene behaviors or water facilities (e.g. water vessels) to have different water quality indices despite using the same water source. During the water sampling in December 2010, it was observed that the water storage vessels in the households differ significantly in configuration and type (open, covered, plastic, metal). The current version of the ABM does not distinguish among types of storage vessels in the households nor does it consider the effect of vessel type on the coliform levels in the stored water. Instead, it assigns to the vessel a random coliform level value, assumed to be Normally distributed, with a user defined mean (input range 0-100 CFU/100 mL) and a standard deviation of 10 CFU/100 mL. The point source element was designated in the ABM to capture that segment in the water chain from the storage vessel to the point right before consumption when additional contamination can enter the water chain. It can represent the cup, bowl, hand, pot or glass that household residents use to draw water from the storage vessel. This point-of-use contamination has not yet been evaluated or measured in the two villages, and in the ABM simulation, WQPS is currently set to 0 CFU/100 mL. Water source elements represent the locations from which the households collect water for domestic use (drinking, cooking, and cleaning). They are spatially stationary and are identified by their latitudinal and longitudinal coordinates as determined during the water sampling in December 2010. Water source elements in the model maintain metrics for quality and reliability. The quality metric for both surface waters and municipal taps is assumed to be a Normally distributed random variable with a user-defined mean (input range 0 CFU/100 mL to 4000 CFU/100 mL). The standard deviations for surface waters and municipal taps are 780 CFU/100 mL and 130 CFU/100 mL, respectively. These values were determined from a statistical analysis of the measured total coliform levels in the water samples taken from December 2010 to February 2011. Allowing the model user to define a specific mean value in a particular run of the model allows for experimentation and sensitivity analysis. The reliability of each water source in the model varies. The Pfaleni, Mutale, and Tshala Rivers are available to the households 99% of the time while the sand filter is only available 85% of the time if the SSF system is operating. The latter assumption accounts for down time when the slow sand filter is under maintenance (approximately one day per week). Based on the 2009 census, the municipal taps are the least reliable of the three types of water sources. In the ABM, they are only available 30% of the time during the base-case simulations. The SSF system is configured to operate in the ABM in three ways: 1) the entire SSF system is working, 2) the sand filter is functioning but the chlorine tanks are not operating, and 3) the entire SSF system is not operational. When the slow sand filter is operating, its effectiveness in removing coliform is based on literature (Huisman and Wood 1974) and is represented as a uniformly distributed random variable with a reduction rate factor between 100 and 1000 of the coliform level in the Pfaleni River. After passing through the chlorine tanks, the filtered and disinfected water is assigned a total coliform count of zero CFU/100 mL. This value will be refined with future field data once the maintenance work on the sand filter is completed. The decision rules of the households pertain to behaviors concerning the selection of water source and practice of hand washing. At every time step, a household will choose a water source based on its preferred source, source availability, and source proximity. The child in the household is affected by this choice despite not playing a role in the decision-making. The decision tree for choosing water sources differs in the two villages, and is illustrated in Figure 5. At each time step, a household in the village without sand filter first checks if a nearby municipal tap is on, and obtains water from this source if this is the case. Otherwise the household chooses the surface water source (Pfaleni River, Tshala River, or Mutale River) that is nearest to its location without regard for the water quality of the source. A household in the village with the sand filters primarily chooses to obtain water from the SSF system if this system is operating. Otherwise, it makes similar decisions on choosing water sources to a household in the other village. Figure 5.Decision tree for the selection of water sources in the two villages. A household in Village 2 obtains water from the municipal taps if the taps are working; otherwise it obtains water from nearby surface waters. A household in Village 1 gets water from the slow sand filter system if this system is operating; otherwise it mimics the decisions of a household in Village 2. Once the household selects a source, the household's WQHH is calculated. This is done in two steps. First, the contamination from the water storage vessel (WQSt) is added to total coliform level of the chosen water source, and then additional contamination introduced to the water prior to its consumption, WQPS, is added. The resulting WQHH is the quality of the water that each child in that household will consume. The child's age is incremented every time step (21 days). The initial 63 under-two-year-olds are assigned randomly to the households in the two villages. Infants born during the simulation are also assigned randomly. Each day when the child drinks water, the occurrence of a diarrheal episode is determined as a random probability based on the total coliform level in the water. Note that the model does not account for infant breast-feeding nor the volume of water consumed by children as a function of age. The coliform level is grouped into four risk categories: 0-10 CFU/100 mL as low risk, 10-100 CFU/100 mL as moderate risk, 100-2000 CFU/100 mL as high risk, and above 2000 CFU/100 mL as extreme risk. The child keeps track of the total number of days of diarrheal illness within the 21 day cycle. At the end of 21 days, the type of ECD experienced by the child is classified into: no effect, acute, prolonged, and persistent. The child's height is then calculated by discounting the WHO standard height for the child at that age and gender. The discounting factor (d) depends on the severity of the ECD frequency and is assigned as normally distributed values with the following distribution: d∼N(0.8, 0.3) for acute ECD, d∼N(0.5, 0.3) for prolonged ECD, and d∼N(0.4, 0.3) for persistent ECD. The height discounting method is applied to the child without regard to gender. The duration of one simulation in the ABM is 1095 days or time steps (three years). Three scenarios were studied to test the extremes of coliform contamination levels: best case, current case, and worst case. In each of these cases, the SSF system was turned off. In the best-case scenario, all coliform contamination levels were set to zero, including at the surface water sources, at the municipal taps, and in the household storage vessels. The current-case scenario utilized the means of the water quality data from the December 2010 to February 2011 water sampling in the two villages. The contamination levels in the worst-case scenario were set to the maximum total coliform levels measured in the water quality testing. Each of these scenarios was run for 100 iterations, with each scenario generating approximately 39,000 child height observations for children aged 12, 18, 24, and 30 months old. The parameter settings for these scenarios are listed in Table 1. Model verification is a key concern in the use of agent-based models to study complex interactions in ecological and social systems (Dong et al. 2010; D'Souza et. al. 2009; Huigen, et. al. 2006). Pattern recognition has been proposed as a verification method where multiple simulations are performed and resulting patterns of behavior are compared with real-world references (Grimm et al. 2005). In the ABM experiments performed for this study, one hundred independent simulations were run for each of the simulated scenarios. For all runs and in all height calculations at different child ages, the standard deviations for child heights were less than half of the standard deviations for the WHO norms. Simulation results for the current-case scenario were also compared with data from the Mal-ED cohort study. In Figure 6, average height data from the simulations for males with ages 6, 9, 12, and 15 months are plotted together with aggregated height data from the Rambuda study area. Height measurements generated from the ABM simulations fall within 95% confidence intervals of the empirical height data from the Mal-ED study. The Mal-ED data were aggregated from data for all villages in the Mal-ED study. The additional villages are adjacent to the modeled villages; they also share similar environmental and socio-economic characteristics. These similarities enabled the use of a larger data set on actual child heights that can be used to verify the simulation results from the ABM. Figure 6. 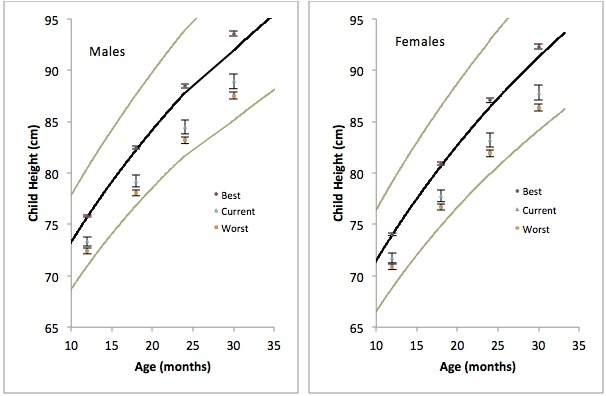 Mean heights of male children at ages 1-16 months. Results from the ABM simulation (dots) are within the data from the Rambuda Mal-ED study (triangles with error bars spanning 95% confidence intervals). 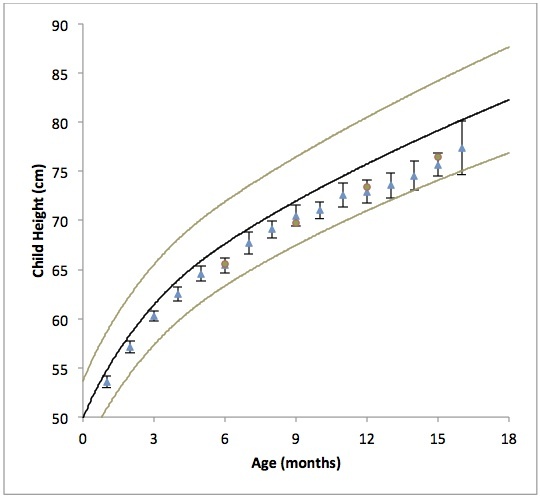 Both Mal-ED and ABM simulation data indicate stunting in children when height measurements are compared to WHO norms (middle curve, with +2 and -2 standard deviations indicated by the top and bottom curves, respectively). Figure 7 shows the effect of water quality on child growth in the modeled villages. For each simulated scenario, average child height data for ages 12, 18, 24, and 30 months are plotted by gender alongside WHO norms. At the current water quality level of the sources, simulation results indicate stunting of both male and female children. When provided with quality water (best case), children grow along the WHO normal growth curve. At extreme coliform levels, the children are stunted to below -1.0 standard deviations of the WHO height norms. Figure 7. Plots of children's simulated heights at ages 12, 18, 24, and 30 months. Each height measurement is the sample mean of 100 independent replications, with error bars indicating standard deviations. At the current water quality level of the sources, simulation results indicate stunting of both male and female children. When provided with quality water (best case), children grow along the WHO normal growth curves. At extreme coliform levels, the children are stunted to about -1.50 standard deviations of the WHO height norms (middle curve, with +2 and -2 standard deviations indicated by the top and bottom curves, respectively). The simulation results for the three case scenarios demonstrate the effect of water quality on ECD and child growth. As the water quality deteriorates, the ECD rates increase, and the children's HAZ-2 scores decline. The architecture of the agent-based model also provides further opportunity for exploring the stunting effect of coliform levels higher than the 103 CFU/100 mL concentration that is simulated in the worst-case scenario. Such extremely poor water quality may result in severe stunting cases (HAZ-2 below -3) similar to what were reported in other developing countries (Checkley et al. 2008). The model design also allows for identification of the entry points of contamination along the water chain, aiding in the selection of targeted interventions that can bring current-level water quality closer to best-case level. Calibrated agent-based models, as opposed to observational trials, can execute a more rapid assessment of potential outcomes arising from health interventions. The ABM presented in this paper can be used to evaluate the effectiveness of intervention strategies for improving health and water quality in two modeled villages. The health benefits of community-level interventions such as increasing source reliability and instituting policies on water quality can be studied by running simulations with appropriate parameter settings. For example, by modifying the ABM and the rules of behavior of the households, the potential magnitude of the health impact of installing a sand filter can be evaluated. Likewise, the over-all effect of point-of-use water treatment such as ceramic filtration, boiling of water, and chlorination can be investigated by modifying the attributes and behavioral rules of the ABM agents. The ABM can also be applied to other developing regions worldwide facing environmental conditions similar to those in the modeled villages. The ABM template can be easily modified to account for spatial and demographic differences. Detailed but manageable modifications may be required for changes pertaining to water quality, contamination pathways, and agent interactions and behaviors. The water quality (coliform) in the households is assumed to be the cumulative contribution of each identified contamination source in the water chain. This, of course, is a simplification as the contributions of the various sources are not necessarily additive. The functional form of the water quality index will greatly benefit from the analysis of additional field data as they become available. Also, the model does not consider the kinetics of bacterial growth as water is transported along the chain. Bacterial growth and decay can be a critical factor in accounting for coliform sources in the water chain, especially during long storage durations in contaminated water vessels. Further, the model uses only total coliform as surrogate pathogen on which the ECD rate adjustments are based. In reality, some microbial species such as Shigella, Cryptosporidium, and rotavirus can be substantially more potent at significantly lower concentrations than the total coliform levels used in the simulations (Moore et al. 2010). The model focuses on children's growth experience as compared to World Health Organization norms—Height-for-Age-Z score at 2 years (HAZ-2). It is known that children's growth limitations are related to the incidence of Early Childhood Diarrhea (Dillingham et al. 2004). The model, however, does not account for other possible causes of stunting such as malnutrition, low birth weight, and even genetic causes. The ABM only has a limited adjustment for the seasonal fluctuations in water quality due to limitations in available field data. In the current model, the coliform level in the surface waters is increased during the last 90 days of each year in the 3-year simulation. This increase mimics the possible decline in water quality during the rainy season. In the model, this poorer water quality is represented as an increase in coliform count by a value that is a Normally distributed random deviate with a mean of 100 CFU/100 mL and a standard deviation of 25 CFU/100 mL. This coliform change may be too low to cause substantial effect on the ECD rates, but it will be updated in later versions of the ABM as new field data become available from the ongoing water quality monitoring. Lastly, the ABM simulation results were not verified against actual ECD rates in the study area. These data are not yet available to the researchers. However, statistical comparisons will be performed on ECD rates and water quality when data from the Mal-ED study become available. Future work on the ABM is planned in three areas: 1) refinement of the input data on water quality and of the coefficients correlating water quality, ECD rates, and stunting; 2) inclusion of other data and algorithms that will refine rules of agent behaviors; and 3) addition of other model features that will allow evaluation of health interventions. Once completed, the year-long water quality monitoring will provide data that account for seasonal water quality fluctuations of the water sources and other water quality metrics at the point-of-use (e.g., for WQPS and WQSt). Human agent behaviors such as hand washing practices will also be added in succeeding versions of the ABM. Finally, intervention strategies at the community or point-of-use level can be evaluated by modifying the attributes of the model environment and the agents in the model. Community-level interventions include increased reliability of water sources and construction of a slow sand filter in one of the villages while point-of-use interventions can include hygiene education (e.g. on hand washing and sanitation) and use of household water treatment technologies such as ceramic filters and boiling of water. ARNOLD, B.F. and Colford, J.M. (2007). Treating water with chlorine at point-of-use to improve water quality and reduce child diarrhea in developing countries: A systematic review and meta-analysis. Am J Trop Med Hyg 76(2):354-364. ASIAN DEVELOPMENT BANK. (2002). Impact Evaluation Study On Water Supply And Sanitation In Selected Developing Member Countries. Manila, Philippines: Asian Development Bank. DEMAREST, J.B. (2011). An Agent-based Model of Water and Health in Limpopo Province. [Thesis] University of Virginia. D'SOUZA, R.M., Lysenko, M., Marino, S., et al. (2009). Data-parallel algorithms for agent-based model simulation of tuberculosis on graphics processing units. Proceedings of the 2009 Spring Simulation Multiconference. San Diego, CA: Society for Computer Simulation International. ESREY, S.A., Feachem, R.G., and Hughes, J.M. (1985). Interventions for the control of diarrheal diseases among young children: improving water-supplies and excreta disposal facilities. Bull World Health Organ 63(4):757-772. ESREY, S.A., Potash, J.B., Roberts, L., et al. (1991). Effects of improved water-supply and sanitation on ascariasis, diarrhea, dracunculiasis, hookworm infection, schistosomiasis, and trachoma. Bull World Health Organ 69(5):609-621. GUERRANT, R.L., Moore, S.R., Lima, A.A.M., et al. (1999). Association of early childhood diarrhea and cryptosporidiosis with impaired physical fitness and cognitive function four-seven years later in a poor urban community in northeast Brazil. Am J Trop Med Hyg 61(5):707-713. HUIGEN, M.G.A., Overmars, K.P., de Groot, W.T. (2006). Multi-actor modeling of settling decisions and behavior in the san mariano watershed, the philippines: A first application with the MameLuke framework. Ecol Soc 11(2):33. HUISMAN, L. and Wood, W.E. (1974). Slow Sand Filtration. Geneva: World Health Organization. INSTITUTE FOR HEALTH METRICS AND EVALUATION. (2010). Financing Global Health 2010: Development Assistance And Country Spending In Economic Uncertainty. Seattle, WA: IHME. JENSEN, L. (2010). Millennium Development Goals Report 2010. New York: United Nations Dept. of Economic and Social Affairs. KOSEK, M., Bern, C., and Guerrant, R.L. (2003). The global burden of diarrhoeal disease, as estimated from studies published between 1992 and 2000. Bull World Health Organ 81(3):197-204. NIEHAUS, M.D., Moore, S.R., Patrick, P.D., et al. (2002). Early childhood diarrhea is associated with diminished cognitive function 4 to 7 years later in children in a northeast Brazilian shantytown. Am J Trop Med Hyg 66(5):590-593. PRUSS, A., Kay, D., Fewtrell, L., et al. (2002). Estimating the burden of disease from water, sanitation, and hygiene at a global level. Environ Health Perspect 110(5):537-542. TARLETON, J.L., Haque, R., Mondal, D., Shu, J.F., Farr, B.M., and Petri, W.A. (2006). Cognitive effects of diarrhea, malnutrition, and entamoeba histolytica infection on school age children in Dhaka, Bangladesh. Am J Trop Med Hyg 74(3):475-481. THE INTERNATIONAL BANK FOR RECONSTRUCTION AND DEVELOPMENT / THE WORLD BANK. (2010). Global Monitoring Report 2010: The MDGs After the Crisis. Washington, DC: The World Bank. WORLD HEALTH ORGANIZATION. (2006). WHO Child Growth Standards. Geneva: World Health Organization. WORLD HEALTH ORGANIZATION. (2008). Guidelines for Drinking Water Quality, 3rd edition. Geneva: World Health Organization. YOU, D., Jones, G., and Wardlaw, T. (2010). Levels & Trends in Child Mortality. NY: United Nations Children's Fund.